Defending NASCAR Midwest Series champion Justin Diercks made the long, 15-hour plus trip to Greenville, South Carolina from his Iowa shops to compete in the Southeast Series opener at Greenville-Pickens Speedway. 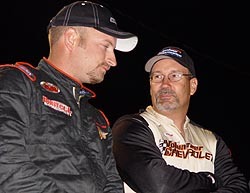 Just like last year, when Midwest Series driver Brian Hoppe won the Southeast opener at Nashville, Diercks was hoping to come in and beatup on the Southeast regulars and show them who was boss. Well, Diercks will be the first to say that Greenville isn’t really a track that you can just show up to and be good. It is a track that gives fits to the SES regulars, let alone an outsider. And considering the fact the schedule was pushed back because of rain and practice time was cut short, Diercks will take his seventh-place finish and go back to Iowa happy. “I’m happy with the finish that we had because all weekend we struggled,” said Diercks, who won the Midwest opener at Rockford (IL) earlier this year. “It was my first time running here and running with these guys. We actually had to pull out setups that we’ve never run before because we were really bad with the setups that we normally run. “The lack of practice hurt a lot. One hour wasn’t enough for us. We were scrambling. We weren’t able to sit there and focus on what we really needed to change. We were just throwing things at it. It bit us. That is alright. You’ll have that once in a while. That is what makes you feel better; you know that you got cheated on practice but still had a top-seven car. Diercks was still uncertain at the end of the race as to if he would try and run the Houston (TX) race this coming weekend. He was not, however, planning to run the entire MWS and SES schedules. “We’re not planning on doing both divisions right now. I’ve raced in the Southeast Series before and had a lot of fun. This year we as a team thought it was important to get to some of the Southeast Series races to see what it’s like here. I think we’ll be able to run in the top-five, gain some experience, be competitive and just help put on a good race. “Erik Darnell raced in both divisions last year and he got a lot of attention for it. I just want to throw my name out there and see how well we stack up against the best Southeast Series drivers. I’m just hoping to do the best I can and learn as much as I can. It started when Richardson wrecked his car in qualifying. The wreck was bad enough to knock most teams out of an event and cause them to load up and go home. Richardson himself got out of the car and hobbled to the ambulance after banging his knee on the steering shaft. But not Richardson and his team. They went to work right away, busting tail and getting the car ready to go to at least be able to start the race. But Richardson did more than start the race. After coming from 20th, he made it all the way up to ninth before getting involved in another accident, this one far from his doing during the race. How bad was it? Even when they got the car finished and were in the process of pushing the car through tech just to get it out on the starting grid, the team got a flat. It typified Richardson’s day and night. “Everyone has been a lapped car at one time,” said Prince after the race. “He was a lap down and I was fifth coming through there; he obviously isn’t going to get his lap back from me. He just raced me into the corner and took me out. There is no excuse for it and nothing else to say. He ‘dummyed’ out. That is the best way to say it. I think he forgot where he was for a minute. Prince went in for the stops in the lead, but came out third. When the SES cars visit Greenville, a pit stop is mandatory during the race. However, no tires may be changed and a legal stop consists of just coming to a stop in your pit box, putting the jack under the car and taking off again. It is something very few people, including Prince, like. Jason Hogan hates going to racetracks that he isn’t very good at, but not because of that fact alone. He has said before that those tracks just make him want to keep coming back in order to conquer his adversity out and make himself better as a driver. Greenville-Pickens Speedway in South Carolina was one of those tracks. So heading into Greenville, Hogan was cautiously optimistic. 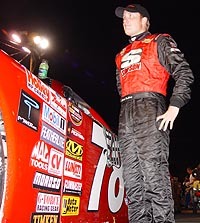 He was coming off of four-straight top-five finishes in his Super Late Model and two of those were wins. He was riding a hot streak and, with his new driving style and what the team had learned recently, he was ready to try and conquer Greenville’s flat, half-mile again. A top-five finish would be considered a moral victory for him and the team. Kevin Prince was in select company on Saturday night. He was the only driver, other than Jeff Fultz, to lead a significant number of laps in the race. He led the first 50 before giving way to others and eventually teammate Fultz after a round of pit stops. So after settling into third after the stops, Prince just rode. He was riding around in fifth when disaster struck on lap 130 when the lapped car of Allen Karnes got into him, spinning him out. Robert Richardson was collected along with Prince in the accident. Prince fell two laps down and had to settle for 11th at the end of the night. 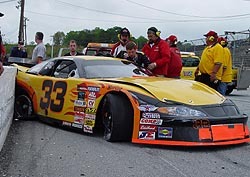 Robert Richardson trashed his car in qualifying, but the team worked hard and got it fixed for the race. 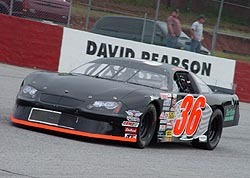 Hogan posted a third-place finish in theNASCAR Southeast Series opener at the track on Saturday night. The result was his best-career finish at the track in seven attempts. “I’m so happy, I could cry,” said Hogan after the race. “We were really shooting for a top-five coming into the race and just coming out of here with a car in one piece is a plus. So to come out of here with a top-three is like a victory. What was the big turnaround for Hogan? Well, it was a variety of things. “I learned tonight that the secret to this place is finesse. We’ve learned a lot of stuff on the Super Late Model this year which we applied to this car, but more than anything, driving the racetrack a certain way means a lot. I learned that the last time we were here and I applied more of it this time. Most drivers race years and years to make it to the level of the Southeast Series. Justin Wakefield is no different. But the difference with him and most was that, when he made it to SES, he was a veteran dirt driver. Hogan found the "hot spot" at Greenville. 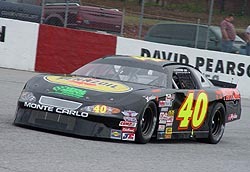 It was just two years ago, the first race of the 2003 season, when Wakefield made his first career Southeast Series start. Not only was it his first SES start, but it was his first career race on asphalt after spending years racing Dirt Late Models. Just two years later, at the same track, Wakefield picked up his best SES finish to date, coming home second to Greenville dominator Jeff Fultz. me like I was tied to a stump. I think I’ve come a long way since that first race. “It feels really good to start out the year like this. This is a much better way to start the year rather than with a wrecked racecar like we did last year. The second race we blew a motor. We totaled a car at Nashville. We ran out of gas at Kentucky. So it feels good to finally start out good. Charlie Bradberry has the mindset of a past champion. 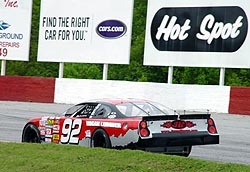 It was pretty evident during season opener at Greenville-Pickens Speedway on Saturday evening. It was even more evident after the race. 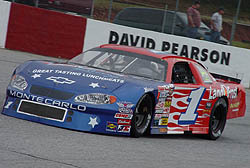 Bradberry returned to the Southeast Series in 2005, looking for his second series title in three years after winning it all in 2003. Bradberry came into Greenville hoping for the best – a win. But he knew that his past at Greenville hasn’t treated him all that well, so a top-five would do. Well, after qualifying fourth, Bradberry raced his way into the top-five and stayed there most of the night, running as high as third at one point. But from the cockpit, Bradberry knew he didn’t have the car to win. So what did he do? He acted like a past champion and knew that just finishing as high as he could would benefit him more in the long run rather than trying to make something out of nothing. He finished fourth. “We came into this deal definitely wanting to win the first race, but I know what it takes to win the championship,” said Bradberry. “If you can’t win the race, you need to finish in the top-five. That is what we did. I am pleased with our first race, because we did exactly what we wanted to do. I know you can’t win them all, but to win a championship, you have to be consistent every week, and this is a good start. “I’m happy to finish top-five here for sure. This has not be a track that has been very good to me over the years. And I feel like it was the best car I’ve ever had here and I finished fourth. So I feel like we are doing just fine. Again, Bradberry knows that if his car isn’t just right in his first trip to Texas (last year’s SES race at Houston was the first time the series had raced in Texas), that he just needs to finish as best as he can and look at the big picture. 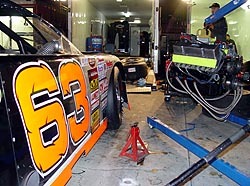 During the off season, Dusty Williams moved his entire, family-owned Dixie Racing team from Savannah, Georgia to the Charlotte area. He also got a new crew chief in Tracy Norman. Basically, it was a brand new team for all intensive-purposes. So to finished a solid sixth in his first outing of 2005 after struggling so bad in 2004 was a big relief for Williams. “The guys didn’t want to have to pull too many all-nighters to get it ready for Houston, so bringing it home in one piece was our primary goal and that is what we did tonight,” said Williams. “The car wasn’t really on top of the game because we were great in practice. “We put on some new tires for qualifying and they were way off. We didn’t have the car in the race that we did in practice. The Texas boys (Chris Davidson and Robert Richardson), Connecticut’s Walter Sutcliffe and Iowa’s Justin Diercks weren’t the only guys that came from a long way away to race in the SES opener. So did Minnesota’s Dan Fredrickson. However, Fredrickson doesn’t plan on the trips being very long after this past weekend. “The Southeast series has a lot more attractive schedule as far as the big tracks and the high banked tracks,” said the former ASA and former MARS regular. “So I’m planning on moving to Mooresville in the next couple of weeks and run as many of these races as we can. We’ve got everything we need to compete. We were running pretty strong tonight. The car just went away on us. “The panhard bar bracket starting splitting. I felt it around lap 25. We came in for a pit stop and I think the jarring of the pit stop did it in finally. So we decided to park it before we did anything to the car. To call Gary Helton a rookie is a joke. But technically, according to the rulebook, he is just that, at least when it comes to the Southeast Series. 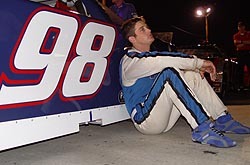 But it didn’t take long to show why Helton, the former Southern All Stars Super Late Model champion, will be someone everyone else has to deal with in 2005. Helton grabbed the pole for the Greenville race, then came from an eighth-place starting spot (after the invert) to finish fifth. 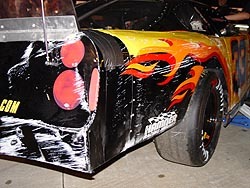 Helton raced ok. He wasn’t entirely happy with it, but he knew it was good all things considered. Seemed to be that a reoccurring theme on Saturday was that of racers having a “long day.” Greg Pope might have challenged Robert Richardson for the worst day. Chris Davidson (left) talks with Gary Helton. Pope blew an engine just as practice started. He and his two-man crew worked hard the rest of the day to try and replace the engine, with help here and there for other teams. He got it replaced and got in the car, literally, as everyone else was going through driver intros. With no practice on the track, Pope got his car out on the track and had it moving toward the front, getting as high as eighth at one point, before becoming the innocent victim of an accident with Stanley Smith. Smith has come to a stop right in the middle of the track with the field bearing down on him. Pope locked up his brakes to try and get around him, but just grazed Smith with the right front, but tearing up his right front suspension in the process. Greg Pope spent most of the afternoon changing an engine.